Discover The Secret To Becoming A WSO Expert – Fast! Update: This course is now a little out of date in terms of the WSO process. However, it is still full of expert strategies and so rather than remove it totally I have decided to offer it for free. Just click the payment button and you will get it for $0! Have you ever wondered what it would be like to be able to produce a WSO and to bump it 100 times KNOWING you are going to make a full time income – every time? A guaranteed income? One that you know is repeatable? If you’d like to build an automated IM business launching WSOs, and being an expert at it so that you knew each and every time you would be successful then read on! You have the opportunity to change your life forever! In my Complete WSO Expert Training I will teach you the exact steps to take so that you can launch a WSO, build a responsive list, promote your own products, make sales, optimise your conversion rate and just bump your WSO with guaranteed results each time! 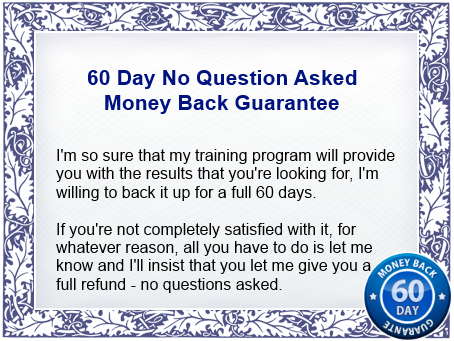 There are over 5 hours of detailed, intense training in this program, and it is organized in an easy step by step method. I also provide you with some PDFs and templates to give you that little bit of extra help. Just go through each of the steps and you will quickly become a WSO Expert! Do I Really Need Multiple Products? You must create your own products to really succeed and you need at least 3 products to produce results that will provide you with a sustainable full time income. Using My Method You Can Easily Create One Brand New QUALITY Product Each Week If You Wanted To! * Why you should use the warrior forum and launch WSOs. * What makes a WSO expert. * How to make huge sales with just one WSO. * Find out how to use the warrior forum to get ideas. * Know what products will be profitable. * My suggested action plan to help you focus in on the best topics for your WSO. * Discover plenty of product ideas for your WSO. * The fastest way to create a good quality, information packed WSO. * Learn how to write an ebook really quickly. I even provide you with a sample ebook template! * The truth about upsells and some ideas. * How to launch your WSO. * You get access to my squeeze page and download template to use yourself. * Learn how to test your sales copy first. * Should you use a dime sale? * Where to get testimonials and affliates on board. * My suggested action plan will see you having your first WSO all set up and ready to go in no time! * Learn how to consistently build a solid relationship and trust with your list. * A really easy way to create email campaigns with a step by step example. * I reveal the REAL reason why you need subscribers and how to benefit from them. * My suggested action plan will see you having a 30 day email campaign up and ready and you will have ideas for your next product! You will also be providing valuable content to your subscribers and be building a responsive interactive list. * This is the most important and intense training of all. * Discover exactly how a product funnel works with my step by step example. * I provide you with everything you need to know in order to start creating products EVERY month! * My suggested action plan will take you to promoting your first paid product within weeks of starting this training! * How to test and track your campaigns. * I tell you exactly what to test and how to use the data you get! * Save time by re using material! I show you the right way to do this – find out how you can reuse material for traffic generation as well as more products! * When to start bumping your WSO. * My suggested action plan will direct you in preparing your next product and email promotion campaign. * You’ll also learn how to produce a sustainable, repeatable business plan. What good is a system if you can’t repeat it? I want a business that I know I can guarantee revenue with – you will learn how to create the same for your own business. Is This What You Have Been Looking For? The Truth About WSOs? How Would It Feel To Finally Launch a WSO Like The Gurus Do? To discover how to be a pro at launching a WSO? I know I should be charging way more for this level of specialist training but I want YOU to be able to accomplish this. Why leave it to the gurus? So that’s just $147 $77 to learn how to become a WSO expert really quickly. Create your own product funnel within a month if you follow my method and test your way to having a guaranteed income every time you bump your WSO! Update: This course is now a little out of date in terms of the WSO process. However, it is still full of expert strategies and so rather than remove it totally I have decided to offer it for free. Just click the payment button below and you will get it for $0!